Today’s recipe is from Paulding & Company, a Bay Area catering business run by culinary instructor and chef, Terry Paulding. Along with offering a full range of catering services, Terry Paulding and her daughter, Tracy, host team building classes, cooking parties and kids’ cooking camps in a converted warehouse kitchen in Emeryville. Based on my experience with Terry, I can attest that she is a fantastic cooking teacher who can tell you exactly why something didn’t work and what you need to make it better. In addition to that, she is generous! Terry shares her recipes in the Paulding & Company recipe section, so anyone can take advantage of her expertise. She’s got a lot of recipes for butternut squash right now including this Harvest Vegetables recipe which I’m making tonight. 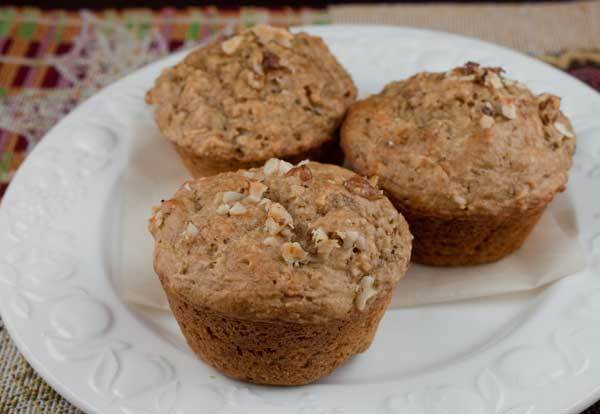 But if what you are looking for is baked goods, I have another recommendation: Terry’s Apple Oatmeal Muffins. This muffin recipe is about as easy as they come, but I goofed up and my first batch came out flat. I emailed Terry who replied immediately to troubleshoot. She had several suggestions and mentioned that the batter was supposed to be thick since the oats soaked up the moisture as they sat. At that point my mistake became obvious. Thinking it was a “convenience” step for people who wanted to have muffin batter mixed and ready to go in the morning, I skipped the step of soaking the oats overnight. So after Terry told me exactly how the batter should look and recommended I give the oats a soak, I tried again and had big, plump, almost fat-free muffins. They taste great and their nutritional profile is such that I won’t feel guilty throwing one in Fuzz’s lunch box. If you try the gluten free variation, let me know how they taste. I made the wheat flour version but am curious to know what the texture is like when made with gluten free flour and almond meal. This recipe was developed many years ago by Terry Paulding who created them for a recipe project in a food science class. They're made without any oil or butter. In a large bowl, combine buttermilk, oats, eggs, sugar, apple, and your choice of optional flavor additions below. Soak the mixture overnight so it will be ready at breakfast, or soak the oats for a few hours so that the oats will absorb the milk. Combine flours, baking soda, baking powder and salt. Sift. Set aside until ready to mix. In the morning, or whenever you're ready to mix the batter, preheat oven to 375°F. Grease a 12 ct. muffin tin very well, or line it with paper muffin. Fold sifted dry ingredients gently into buttermilk mixture until just combined. Do not over-mix. Fill muffin tins (easy with an ice cream scoop). Bake 25 - 30 minutes, until brown and fragrant. Loosen from tins immediately. These muffins keep well for several days, and can be frozen. Flavor additions: 1 cup fresh blueberries, plus grated zest of 1 orange or lemon, 2/3 cup raisins and 1/2 cup chopped walnuts, 1 cup fresh cranberries (ADD 1/3 cup white sugar), 2/3 cup dried cherries or cranberries & 1/2 cup chopped pecans. -- You get the idea, make up your own combos! The muffins sound good and Terry Paulding sounds like a gem.